Flutter separately water-melon, cucumbers and tomatoes. Pass them to the metallic filter called chinoise. Blend the three juices and add mixed herbs, salt and pepper. 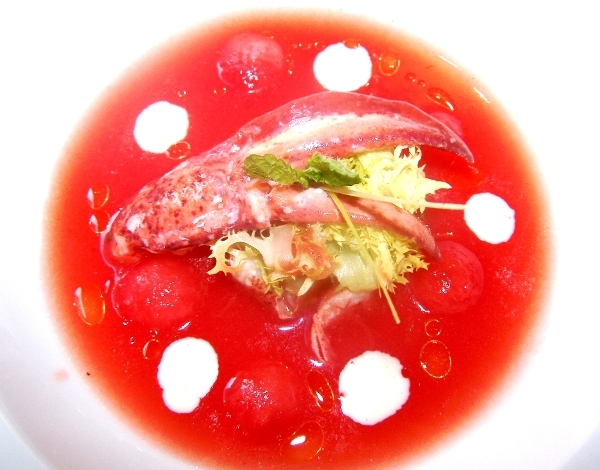 Cook the lobster in the court bouillon for 3 minutes and immediately after cool it in water and ice. Serve putting the lobster on a soup dish with gazpacho and adding the lemon cream prepared emulsifing in the mixer olive oil, lemmon juice and ginger. Maria Grazia Accorsi, Personaggi letterari a tavola e in cucina. © Copyright roma-gourmet.com 2007. All rights reserved. Prohibited the reproduction of content, even partial.